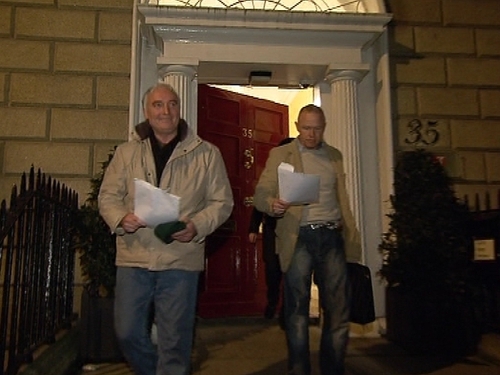 Two men who had been staging a sit-in at the offices of the Taxi Regulator in Dublin have ended their protest. The taxi drivers were protesting over what they claim is the unfair regulation of the industry. Pat Walsh from Limerick and Tom Hanlon from Dublin had been in the building since 3pm yesterday afternoon. The two men decided to leave when they were served with High Court orders. Mr Walsh said they had held the protest simply to secure a meeting with Minister for Transport Noel Dempsey about the taxi industry, but had been served with injunctions instead. Mr Hanlon said the industry needed to be cleaned up, there were too many taxis and drivers were killing each other for work. He said people driving a taxi were entitled to earn a decent living and Minister Dempsey would have to listen. In a show of solidarity for the two men, taxi drivers had staged a protest in Dublin city centre causing severe traffic disruption. O'Connell Street was closed in both directions for a number of hours. Several other main routes in the city were also blocked. All roads in the city centre have re-opened and traffic is moving freely once again. Taxi services were disrupted at Dublin and Cork airports after over 400 taxis stopped work at 8am this morning. The President of the Irish Taxi Council earlier warned that drivers could escalate their action if their demands to meet the Minister are not met. Frank Byrne said drivers were calling for the implementation of reforms to the industry, which were drawn up by the Oireachtas Joint Transport Committee. However, a spokesman for the Minister for Transport said the protest was doing nothing to address the challenges the industry is facing. Taxi drivers gathered in Limerick's Pery Square this afternoon as part of the protest. Around 100 drivers responded to a call to show solidarity with drivers in Dublin. Services were disrupted for a short time this afternoon, but have since resumed.